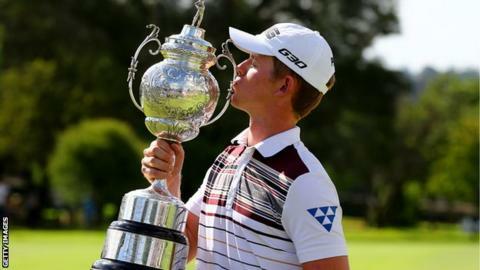 Brandon Stone fought back in the final round to win his first European Tour title at the SA Open in Johannesburg. Stone went from five shots ahead to two behind after six bogeys in seven holes but recovered with four birdies to post a one-under-par 71 to win on 14 under. The 22-year-old becomes the youngest winner of the event since 1997. Stone won by two shots from fellow South African Christiaan Bezuidenhout (67), with England's Daniel Brooks (72) a shot further back in third. He broke down in tears after his victory and told Sky Sports: "I don't have the vocab to describe how I feel right now. "That round was the most up-and-down round that I've ever had in my life. "Walking up to the 18th made me think about how the last few years have been up and down and up and down and just to pull it through at the end there, I can't describe it." Branden Grace and former major winner Retief Goosen ended in a four-way tie for fourth. Will golf begin again for Tiger at 40?